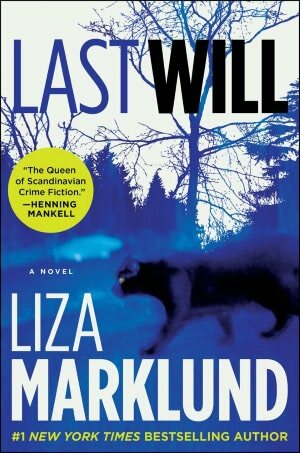 Last Will is a fantastic, intelligent crime thriller, containing all the elements I love about the genre. Annika Bengtzon is a crime reporter for the Evening Post, a tabloid newspaper. She’s attending the annual Nobel banquet for the paper, a formal ceremony in which the new laureates dine with the Swedish royal family and assorted dignitaries. Annika is dancing with another reporter when shots are fired – the laureate for medicine and the head of the Nobel committee are hit. Because Annika is a witness, the senior police investigator “Q” slaps a non-disclosure order on her under terrorist legislation. Annika’s boss is only too keen to find an excuse to keep her away from the office for a while, so she agrees to a period of paid leave. She and Q go back a long way, however, so she keeps up with the investigation, soon realising that the official solution as reported in the papers is a long way from the real truth of the events of that night. Annika also gets to know some of the biological scientists who work at the Karolinska Institute, finding out about their work and how the Nobel prizes are decided upon each year. During this time, Annika moves house into a rural suburb just outside Stockholm, using the money she was awarded in Red Wolf, the previous novel in the series. Annika’s marriage to the selfish, smug Thomas is on the rocks — though she is a devoted mother to her two young children and would not do anything to jeopardise their well-being. Thomas not only exploits Annika on the domestic front, but is becoming politically incompatible with her: he has moved from his original job in local government to a new position in the Ministry of Justice, helping to prepare stringent new anti-terrorist legislation that Annika finds appalling. Not only are things bad with Thomas, but Annika’s oldest friend Anne, who regular readers will know has gone through many ordeals with Annika in the past, has become increasingly unstable and unsympathetic as her own life and career implode, criticising Annika while at the same time sponging on her. Last Will is by no means overwhelmed with domestic trivia, however. It is a clever, muscular thriller, combining exciting action with analyses of many contemporary issues: the dangers of security and terrorist legislation, in particular in the tragic case of a man accused of the Nobel atrocity; the plight of modern journalism and what proprietors do to survive in the internet era; the politics of the science profession and the scope for corruption by the financial interests of drug companies; some great descriptions of biological research; the ethics of scientific publication; and, underlying it all, a cracking, puzzling crime – why was the Nobel victim chosen, who was behind the events of that night, and what is the relationship between the first and subsequent crimes? None of these themes is treated as a cliché or in any predictable way; each is attacked with a fresh perspective by the author, abetted by Annika’s characteristic refusal to compromise. One of the strengths of this novel is the author’s ability to convey vividly the stresses of modern parenthood and family life, from apparently trivial incidents with difficult neighbours to dangerous events between school “friends”. Without overdoing it, many of the elements in the story turn out to be either related or to have a direct impact on the climactic events towards the end. I can’t recommend this novel too highly. This series has always been one of my very favourites, but here the author has surpassed herself with a great story, some intriguing historical elements, and convincing human interest – Annika’s dilemmas as a mother, wife and dedicated professional journalist are conveyed in a completely convincing manner that had me rooting for her at the end when she is forced to make a critical decision. And the crime plot is as solid and multi-layered as any I’ve read, as Annika’s tenacity and courageous nature force her to try to uncover what’s really going on. Neil Smith’s translation is remarkably natural, matching the author’s message with perfection. This novel is going to be hard to beat as my crime novel of the year. I purchased the US edition of this book. The UK edition is apparently not out until September, but second-hand versions of the US edition are available on UK Amazon. Other reviews of Last Will: The Mystery Gazette, Marianne Delacourt and Bookreporter. Euro Crime: listing of Liza Marklund’s books, with links to reviews. Wikipedia: about the author and her books, including the Annika series in reading and chronological order. Movie news: this book has been made into a Swedish film called Nobel’s Last Will, first in a series of six based on the novels, starring Malin Crepin (pictured above) as Annika – who is dark-haired in the books. The series, made by Yellow Bird, has been sold to the USA, Australia/NZ, Brazil and Benelux. Great review! I found it in the library system and put it on reserve, and cannot wait to read it. It has science, politics, family and personal plot lines. What more could a reader want? I an happily in the middle of The Potter’s Field, Camilleri’s latest book and have a stack of books from the library, but I will gladly move this one to the top of the group when I actually have it in my hand. Hope you like it, Kathy. There are a couple of animal experiment parts, but they are dealt with briskly. That’s a price to pay for modern biomedical research for which many of us have to thank for medicines etc that save lives. I loved The Potter’s Field, so glad you are enjoying it. Maxine – I’m so very glad you liked this one as well as you do! Very seldom am I disappointed in Marklund’s Annika Bengtzon novels and it’s very good to hear that this one is no exception. Thanks for this superb review, too.As always, you do an excellent job of pointing out the story’s elements and quality without giving too much away. Thank you, Margot! I think this one can be read on its own, as the plot is self-contained. I think it is better if we’ve been on Annika’s previous life-journey with her, but if not, I think the book would work well. I just hope she cracks that infamously hard (for foreigners, esp translated) US market…..Being co-author on a previous book with James Patterson, even though the book was rubbish (well, the first chapter was! ), can’t do her sales any harm, one hopes. I thought of you when I saw that photo, Norman! And it is a very good depiction of biology research, impressive on the T-cell receptor and the like. A master-class in not dumbing-down yet being compelling & exciting. I look forward to your review. High praise indeed Maxine. Thanks for a very tempting review. I will add Marklund to my list of authors to read but probably start with one of her earlier books. Am so glad to hear this Last Will does not dumb down the science. For me, it’s always good to learn through fiction. The question of animal testing is very controversial. I think if it’s done humanely and the animals are treated well and it’s for the purpose of saving human lives, that it’s ok. I worked in a lab tied to a big hospital in my city which tested rabbits with ocular cancer. The animals were treated humanely. The studies translated into successful eye surgery for people with ocular cancer. Yet I see in horror how primates (for testing) have been mistreated over here to the point where I join the clamor for them to be in sanctuaries, outside, playing with each other, and I’d gladly donate for that. They’re social beings and have been kept in tiny cells alone, apart from others. Anyway, I look forward to reading this book and passing it along to friends, once I leave sunny Vigata, with Montalbano reading Camilleri for lessons on his case. His torturous aging process is quite something. Thanks, Kathy. Like many apparently simple issues, animal testing is something that requires a nuanced view. Cosmetic animal tests have been appalling, but now improved somewhat – & what’s the justification for constant new cosmetics? The profit motive pure and simple. Biomedical research, now, is quite another issue so long as, as you say, the animals are humanely treated. Legislation on that front is very strong in the UK. Oh, yes, I know how Salvo feels as I hit the same problems, maybe not in the sea, but while reading, hearing, my dental issues, etc. The book is great. I think I’m against testing animals for cosmetics; it’s not necessary, hurts animals for nothing, except profits. And the military here uses them for testing weapons; this I oppose. But to save human lives, that’s another matter. (Even Paul McCartner changed his mind after Linda Eastman, his spouse, died of cancer.) But do it humanely; let them be in groups together to socialize, and have fun and stop when it’s no needed. There are chimps rotting in tiny cages all over the country, when they are big, beautiful sanctuaries now. Some animals have been so cramped in and isolated they’ve actually started harming themselves. That all has to be changed, even for medical testing. No need for mistreatment. When I read in a NYT magazine a few years ago, that chimps moved to sanctuaries, where staff give them parties, and wheels in the cakes and toys, the chimps go nuts jumping up and down and cheering, hugging each other and crying — why can’t we just treat them that way all of the time? I suppose one of the cosmetics arguments is/was that the companies are afraid of being sued if someone is allergic to a make-up and their eyes/face etc blows up, so they have to be able to say they’ve done every test known to humankind to avoid liability & paying up. But, the recent breast-implants scandal showed how careful some medical suppliers are……and what an amazing number of women having “cosmetic” implants, what is wrong with the way they look naturally? (no need to answer that, it is a rhetorical question). Anyway, complete agreement on The Potter’s Field. I loved it. I am tempted to buy a copy just to have it later on and to lend to friends. Montalbano consulting Camilleri’s story, playing chess with himself–and losing, crazy Dr. Latte. What a loss for anyone who doesn’t like the Montalbano series. It was like a perfect dessert, eating one bite at a time. Did you review it? And I see The Age of Doubt, the next book will be out over here on May 29. The Book Depository will have it then. Did you read that yet? I found The Potter’s Field review. Agree with it. Also, I found the humor just terrific. I love the chess game, Kathy! Yes, reviewed for Euro Crime here: http://www.eurocrime.co.uk/reviews/The_Potters_Field.html . I haven’t read the next one yet but will look out for it, thanks. I have Last Will from the library, and am using my toughest self-discipline to finish The Invisible Ones before starting it. This is tough! When I started The Invisible Ones and it was slow and I was debating whether or not to go on, I found your revew, read it and decided to persevere — and am so glad I did. First of all, who knew of the Roma population in Britain? I didn’t. Very interesting. When I find a mystery (a good one) based in a different locale either outside or inside another country, I’m like a kid in a bakery. I haven’t seen mention of the Roma except in Nesbo’s Nemesis. I’ll finish Penney’s book, but after that I hope no one expects anything of me until Last Will is finished. Yes, I learnt a lot about this community in this book, Kathy. We do call them Roma these days, but for a long time called them Gypsies (and many still do, out of ignorance). They feature in a big way (and a good way) in Northern Lights, the novel known in the USA as The Golden Compass, by Philip Pullman. But that, obviously, is fantasy whereas The Invisible Ones is a realistic treatment, eg concerning education and so on. I do know about calling them Roma, have met Roma over here at pro-peace activities, and heard some of the history of discrimination against them in Eastern Europe. Also, know of Sarkozy’s deportation of many Roma. And I know the wretched history in WWII. History books reviewed in the last 10 years in the New York Times have mentioned the awful treatment of Roma during the war. However, I haven’t seen them in fiction except in Nemesis, as I mentioned. And I didn’t know of a Roma population in Britain. Philip Pullman was a favorite of friends’ and relatives’ children and I’ve read a speech he gave in defense of libraries and of reading sometime in the last few years in Britain. I like him. Well, I finished The Invisible Ones, and am so glad I persevered. What a special book. I am now sad at having to leave that book, especially JJ. His love for his family and his earnestness about life is quite compelling. I won’t repeat points that are made in your and RTR’s comprehensive reviews, but I am so glad I read it. I feel enriched at having read it. This isn’t too common a feeling these days with crime fiction, but it sure holds up the standard, and shows some books can rise above the ordinary. Now to decompress, take a break and get read to begin such a different read — Last Will. Very glad you enjoyed it, Kathy. Have begun Last Will. Am chuckling over the characterizations of the anti-science groups over here, which, in reality, aren’t humorous at all. They’re working all over the country for rights of embryo legislation, against scientific research and women’s health care. But I like Annika’s attitude. Glad to read that Britain and Sweden have more legal protections for scientific research; wish that were so over here and elsewhere. The only frustration is not being able to turn the pages faster! It isn’t easy for biomedical researchers & research here either, Kathy, but not as bad as in the USA, particularly where stem-cell & embryo research are concerned. The animal rights movement is now targetting carriers to try to terrorise them into not transporting animals. I hope they won’t succeed, given our strong protective/care legislation which is more than adequate. Glad you are enjoying Last Will! I’m not sure I follow the issue of targetting carriers to not transport animals. Do you mean airlines and other transportation methods? I haven’t gotten far enough in the book to deal with some of these issues, other than private donations for research. In the U.S., the animal rights folks vs. carriers is isn’t a big issue, compared to the anti-stem-cell research who also threaten women’s rights. Yes, the Annika books are certainly not formulaic- they are intelligent and address issues in an intellectual way, eg this one and her examination of the origins of modern political terrorism in Red Wolf (written before the Brevik massacre of course). Sorry I wasn’t clear about the carrier issue. In the UK most animal breeding facilities have closed down because of animal rights people’s terrorism against them. therefore animals have to be ordered-in from abroad more likely as not, which is kind of crazy as our laws of husbandry, etc, are much more stringent in the UK than other countries so it is better for the animals if they are bred here. However, the terrorist groups are now targeting the airlines, train lines etc, threatening them with bombs and the like if they transport live animals – trying to cut off the source of supply to the researchers. This is going to set medical progress back by a long way if it continues. Well, I just came off the roller coaster ride that is Last Will. Whew, I’m exhausted. It’s very interesting, riveting and challenging. I must say that Annika is one of the most interesting women to appear in crime fiction. I can’t say that enough. I, too, was rooting for her near the end at home and at work. Thomas’ behavior was intolerable, but how many women have to endure similar scenarios. The scientific, medical and journalist issues were fascinating. The “rendition” issue vs. democratic rights is certainly timely. Journalistic ethics and integrity are also important. Lots to pay attentiion to here. The book moves along at an unrelenting pace. That said, for any mystery reader who wants to spend a weekend reading a substantive, thinking person’s thriller with a great protagonist, read this book. And I would disagree with the few book reviews, which say that Annika isn’t a likeable character. She’s honest and direct. That is refreshing. Hear, hear, Kathy. So glad you lilked it, and thanks for sharing your thoughts in detail. It’s a fantastic crime novel and certainly should win lots of awards and recognition…..Will not qualify for the Int Dagger until next year as it is not published in the UK until Sept, but it has to be an extremely hard one to beat! Maxine – I read The Bomber and I thought it was very good. I never read other books in the series because I was a bit swamped with all the other series I was following and didn’t feel like adding another. Then I read this glowing review. How can any of us who follow Petrona faithfully pass on such a strong endorsement ?! So it goes right to the top of the list. Maybe I’ll become an Annika groupie after all. hi Ken – sorry 😉 If you’ve read Bomber, then you can just go on to Red Wolf and then Last Will. In fact, you can miss out Red Wolf because there are really only a couple of elements from RW you need to know for LW, and both are clearly but briefly explained here (Annika comes into some money via RW and discovers something unpleasant her husband is up to). Last Will is a stellar crime thriller, but I hope that comment is not too subjective! New Liza Marklund fan in the Big Apple. Having loaned Last Will to a mystery reading friend, who likes strong women protagonists, just heard she thought it was great. She’s now looking at what the library has available. I had to say only Red Wolf and The Bomber, and explain the republishing situation and order of releases, and say don’t bother with the book co-authored by HWSNBN.